There is nothing that can strike terror into the heart of a loving animal guardian’s heart quite as much as receiving the news that their beloved furbaby is sick. Many of us have been through the anxiety and pain of learning that our furry companion is seriously ill … or even the indescribable grief of having to let them go. And when they need to spend time away from us, being cared for by veterinarians, the stress of wondering how they are, what they are feeling, and whether they are upset that we aren’t around for them, can be almost crippling. 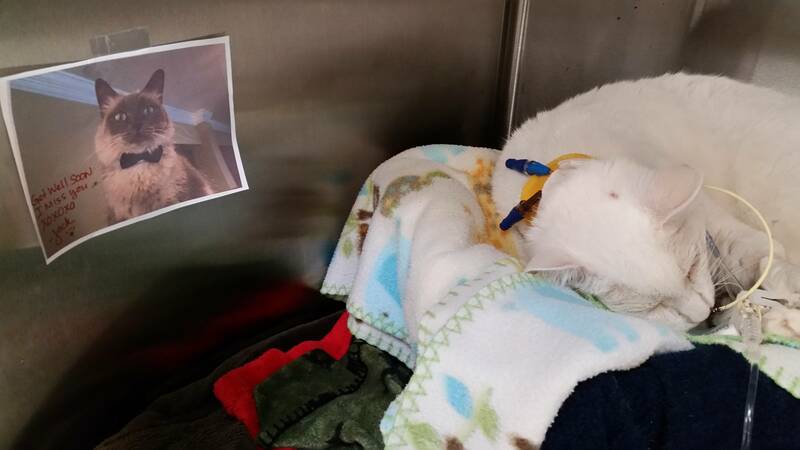 In this picture, taken by Reddit user ilmazziere in the animal hospital where she works, we can see that one doting animal guardian was compelled to leave an adorable get-well-soon note taped by their cat’s bed. The person obviously hoped that the cat would feel their love at all times, even though they could not always physically be there for her. According to the support group Feline Diabetes, which aims to reassure concerned guardians that a diagnosis of this condition in their cats need not be a death sentence, “Cat diabetes is a treatable, manageable condition. You can maintain your sanity and your cat’s health, all on a reasonable budget.” They recommend that the guardians of newly diagnosed kitties register for the Feline Diabetes Message Board (FDMB), where advice and resources are readily available. To find out more about what to do if you, or someone you know, has a cat with diabetes, check out the organization’s FAQ section. As for the kitty featured in this article? Soon after posting the original photo of her with the get-well note, ilmazziere was “happy to report that when I came into work this morning, (she was) like a whole different cat! Greatly improved and hopefully going home soon.” Let’s hope she has many years of continued good health ahead of her!